Last Sunday, I had a blast as "celebrity judge" at Punchline Punchout, where 8 talents comedians faced off against each other trying to out-joke each other based on a topic given to them that day. Thanks Andy Erikson and Alex Stein for the invite. On Tuesday, I podcasted with Jose Rosete, who played the goofball Raheem. Sans fro, we chatted about his acting career, shooting Office Ninja, fitness and our Oakland Raiders. See/listen to the PTMG Podcast episode. Lastly, we got another positive review, this time thanks to Billy Barlett of Giant Fire Breathing Robot. Check it out here. 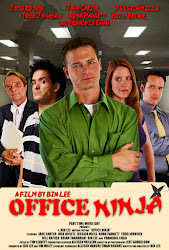 Don't forget to spread the word about Office Ninja either on iTunes or online!